Thermal imaging cameras are used for non-contact temperature measurement and for the detection of twodimensional temperature distributions with high thermal resolution on stationary and moving measurement objects. We have introduced the longtime experience in the field of thermography into our thermal imaging camera series PYROVIEW. The devices are durable, robust and suitable for industrial continuous operation. Our infrared cameras are used in process control and monitoring, quality control, early fire detection as well as for measurements in research and development. What spectral range should my infrared camera have? Please note: To minimize temperature measurement errors resulting from emissivity inaccuracies, you should measure at a short wavelength. DIAS Infrared offers the world’s most manifold range of fixed infrared cameras with optimal adjustment to your measurement task. Please read this article for more information. You are unsure or have questions? Then contact us to solve your measurement task. Here is an overview of all offered spectral ranges of our thermal imaging cameras.. 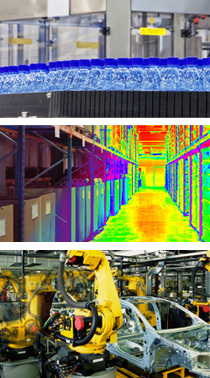 Which infrared camera suits your requirements? Depending on the application our fixed thermal imaging cameras are available with different thermal and spatial resolutions, spectral ranges and temperature ranges as well as with different housing variants. In addition the are numerous motor focus infrared lenses, including wide angle and tele photo lenses, for an optimal adjustment of the camera to different measurement objects and measurmeent object sizes at different measurement distances. Here is a detailed overview of our fixed infrared camera series and models. The table also includes the handheld high-temperature thermal imager PYROVIEW 480N portable. The industrial thermal imaging camera series PYROVIEW compac+ is a new series for stationary use and the exact measurements of the temperature distributions in very compact exterior dimensions. More about the thermal imaging camera series PYROVIEW compact+. In the housing version “protection” the camera is in an IP65-housing with air purge and water cooling so that ambient temperatures up to 150 ° C are possible. Learn more about thermal imaging camera series PYROVIEW protection. Further housings are available for special application. Examples are weatherproof housing, also with pan-tilt-head, and ATEX housing.